Myths and legends form part of ancient history of Manipur. Ruled by more than hundred kings over the years, the ancient history of Manipur goes back to 33 A.D.
Not only was the region ruled by different kings over the centuries, it was called by various names from time to time. 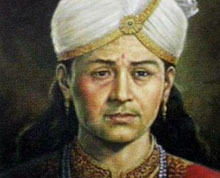 The first famous king of Manipur was Pakhangba who ruled during 33 CE. Maharaja Bhagyachandra, who ruled during the 18th Century, rose with valour and fought against the Burmese to protect his land. He is the person behind the popularity of Vaishnavism in Manipur. British annexed Manipur to the Indian union in 1891 after they defeated the Burmese. Manipur has witnessed many battles during the World War II. 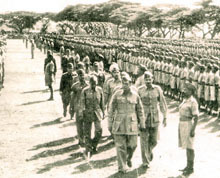 The Indian National Army (INA) led by the great Netaji Subhas Chandra Bose marched towards Imphal before they were defeated by allied forces. Once an independent kingdom, Manipur was declared free once more in 1947. However, the then king of Manipur Budhachandra signed an agreement under which the state became a part of the Indian dominion. In the year 1972, it acquired the present status of an Indian state. The kings of Manipur played important roles in framing Manipur history. The kingdom of Manipur has been known by its various historical names and the present day Manipur during the reign of a total of 109 rulers. From as early as 33 AD, King Pakhangba and his dynasty continued to rule the kingdom directly in chronological order. It was Pakhangba himself who introduced Kangla (traditional seat of royal dynasty) in Manipur. Their rule lasted till 1949 AD when the merger of Manipur with the Indian Union came into effect. The kingdom of Manipur lost its sovereignty in the year 1891 AD after the British defeated Manipur in the Anglo-Manipuri war in Khongjom. (Garib Niwaz) during 17th century further extended the kingdom of Manipur by storming deep into the neighbouring kingdom of Burma. The then Manipur also included parts of Nagaland and Mizoram too. Among the vast chronicles of the Manipur kingdom, Maharaja Bhagyachandra (1762 - 1798 A.D.) deserves a special mention. The famous dance form 'Ras Lila' was choreographed by Maharaja Bhagyachandra. The legendary king spread Vaishnavism in a large scale in Manipur. Credit also goes to the maharajah for fighting and defending Manipur from the Burmese invasions time and again. The merger of Manipur with the dominion of India came with Maharaja Bodhchandra Singh, who continued to enjoy his authority on Manipur for his lifetime as per the agreement. The battle of Imphal was a failed attempt of Japan to invade India during the World War II. A fierce war raged from March 6, 1944 and continued till June 22, 1944. One of the greatest failures of Japan in world history, the huge Japanese army comprising around 120,000 men tried to remove the British and Indian troops out of Imphal, the capital of Manipur and invade India. An intense battle was fought and the Japanese force was driven out incurring heavy losses on them. The supremacy and the command of the British and Indian combined forces in air and artillery during the battle of Imphal brought the biggest success in Manipur history. The battle of Imphal is important from the perspective of Indian War of Independence against the British. The battle actually included the Indian National Army led by Subhash Chandra Bose on the Japanese side. This was because they planned to drive out the colonising British from India and thereby attain freedom but the plan failed. The Manipur hills covered with dense jungle, disease, monsoon rains, exhaustion, the difficult terrain, starvation and supply problems posed severe troubles for the Japanese army. The Japanese logistic plan relied on the captured British supplies, but the supply was cut off by the British and the army starved. The Japanese were mistaken as they thought that the British would not be able to use tanks on the steep terrain. The unfamiliar routes and unfavourable weather conditions loomed large over the Japanese army and eventually led to their downfall. 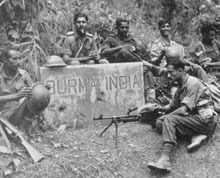 By the end of the Imphal war, the huge number of casualties from the army counted to be 30,000 for the combined Indian and British forces and 80,000 for the Japanese troops. The merger of Manipur with Indian union took place on 21 September 1949 between the then Governor General of India and his highness, the Maharajah of Manipur. An agreement was drafted and accepted by both sides. It was mentioned in the merger pact that Manipur was one of the most uncertain native states due to some 'delicate issues and problems'. Manipur was brought under the administration and jurisdiction of the Indian government in New Delhi. This agreement made between the newly formed Congress-led government of India and Maharajah Bodhchandra Singh of Manipur came into effect from 15 October 1949. The merger of Manipur with India vested all the jurisdiction of the state on the central government. One of the most important chapters in Manipur history, the merger was made to bring peace and improvement for Manipur. However, the agreement stated that the Maharajah would continue to enjoy the same personal rights and privileges he had till date. It also meant that the Maharajah of Manipur, his family and successors would continue to have the authority and power they enjoyed before the merger. In spite of the signing of the agreement, it was decided that the Maharajah of Manipur would continue to have his titles, customs, religious practices, rites, dignities, institutions and ceremonies as it used to be. The transfer of power through the historic merger of Manipur, however, was made in lieu of Rs 30 million annually that the Indian government agreed to pay to the Maharajah and his family. This sum was ensured to cover all expenses of the Maharajah and his family, during his lifetime. The Central government assured Maharajah that his private properties won't be taken away and he would continue to enjoy all the royal privileges. The Meitei Christians are the converts to Christianity from among the Meitei community in Manipur. While the Baptist Christians are spread over hill areas, the PresbyterianChristians of the Meitei clan are present mostly in the southwest Manipur. 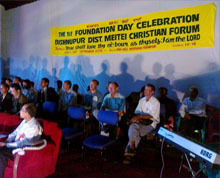 Christians of other denominations are also found in a small numbers among the Meitei community. Political parties woo Meiteis as they occupy an important part in Manipuri society in terms of social interaction and community strength. The movement of the Meitei Christians was started by William Pettigrew, a member of the Anglican Church of England. He came to Manipur in the 1890s and started teaching the Manipuri boys in a school. He established a permanent station for his mission in Manipur and attempted at evangelistic work among the Meitei community. This resulted in the uproar of the conservative Hindus who believed that Pettigrew was trying to impose Christianity among the Meiteis as part of the deliberate colonial policy. However, Pettigrew continued his work and set up many schools in the Ukhruldistrict of Manipur. It is uncertain as to who was the first Meitei Christian convert in Manipur, but names like Parom Singh and Ningol Kaboklei are strong contenders. The social uproar over the conversion to Christianity of Parom Singh under Pettigrew became aggravated as he was just 11 years of age at that time. The introduction of Christianity was an important turning point in Manipur history. Later on Parom Singh helped Pettigrew in his evangelical mission. At present, there are around 20,000 Meitei Christians in Manipur under 1,500 churches.